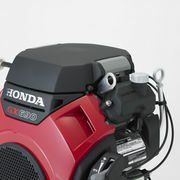 Honda has a V-Twin engine range which has been relied upon by many for work, leisure or play for years. It can power anything from diggers to waters pumps providing reliability and power you can trust. It can even power bigger units used in forestry and construction industries showcasing its ability to work day in day out. 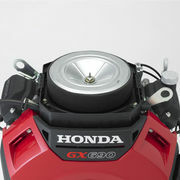 Honda has stated that the fuel efficiency of the GX390 is extremely similar to that of fuel injection technology but still has the simplicity of a carburettor. Meaning that they are both efficient and easy to maintain and work on finding the perfect balance for you. There are multiple features which make this engine one of the best on the market for commercial operations including a forged steel crankshaft, a digital CDI ignition system with variable timing and a rev limiter to stop it from over-revving. RELIABILITY. It's the word which Honda has built their whole reputation around and the GX690 is not about to let that down. The high capacity pump facilitates consistent oil delivery and the oil alert notifies you when the engine is low on oil. The dual cylindrical air filter and large diameter air intake fitted to the engine ensures then engine is cool while operating. All these features combine to produce a product that is designed to go the distance while exceeding performance expectations. Its also backed by a 3 year domestic and commercial warranty!